Product DescriptionAn Asian chef might find this to be the ultimate kitchen tool, as it’s sharp enough to slice through bones and cartilage in one single slice, yet can be used for tenderizing meat or fine dicing as well. 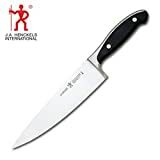 The extra-wide blade with a slight curve is a traditional cleaver design, plus it features the one-sided bevel and hollow-ground back side which ensures swift and confident motion.Amazon.com ReviewA member of the stylish Shun Classic line, this heavy-duty Chinese chef’s knife comfortably handles hearty kitchen tasks ranging from cutting through poultry bones to chopping vegetables. Essentially a cleaver, this tool features a wide, rectangular blade measuring 7-3/4 by 3-3/8 inches. The slightly curved cutting surface rocks gently and maintains its razor-sharp edge. Product DescriptionVictorinox Cutlery is the knife of choice for professionals and consistently receives high accolades in product testing. This “best-in-class” commercial grade cutlery is now available for home use. Victorinox knives feature high carbon, stainless steel blades, hand finished at Victorinox in Switzerland by skilled craftsmen. A special tempering process is used to produce an edge that can be resharpened over and over again, so the knife can keep its original sharpness throughout the entire life of the blade. Victorinox handles are ergonomically designed to minimize wrist tension. They provide a natural fit. A good heft and comfortable, positive grip are indications of a well-made knife. A sure-grip handle with a finger guard is valuable feature since the handle inevitably gets greasy, wet, or both. Although cutlery steel is naturally sanitary, materials and construction details of the handle minimize crevices what would offer hospitality to bacteria. Patented, NSF approved Fibrox handle on 8-inch Chef’s Knife and 5-inch Utility Knives are slip resistant and dishwasher safe. Tomato/Bagel Knifes and Steel have Black Poly Handles.